GUESS WHO PATTAYA’S FOREIGN POLICE CHIEF WENT TO VISIT ON HIS SUMMER HOLIDAYS? Niels Colov, the black uniformed Project Leader for Pattaya’s Foreign Volunteer Police department, consorted with hardened Danish criminals on trips home to Denmark. One of his more recent trips, Colov, also the publisher of The Pattaya People newspaper, went to visit his elderly father, but he could not help but drop in, with his wife Laddawan, on Leon Fristrup Erling Jensen . And the one thing unmistakable about Jensen, better known as Lonne, is his signature ornate bald head. But do not be taken in by the tattoos of ‘Copenhagen’ and ‘Born Free’ and those stars. He is not what Danish police consider to be great patriot and, while he may have been ‘Born Free’, moments of freedom for Lonne have been few and far between. He is a star career criminal. He has spent most of his life in prison for offences of violence, pimping, drugs trafficking and drugs dealing. In fact all of his three children were conceived while his Thai wife visited him in various jails in Denmark, claim the Danish press. Thai wife? Yes. Lonne is an ex-Pattaya resident. He had a bar in the resort and ran there for cover when things got a little hot in the Danish capital. Below is the fuller picture in the newspaper Ekstra Bladet after his arrest at Don Muang airport in 2005, on this occasion for ordering the burning down of someone’s house in Kokkedas, Denmark. The caption on the front page splash story reads: ‘Lonne Held In Thailand’. No need to say any more apparently or even use his real name, everyone in Denmark knew who Lonne was. And here Colov is in Lonne Jensen’s garden in the Copenhagen suburbs in 2010. Spot that head? Is Niels Colov pulling the wool over the eyes of Pattaya society? Along with his chum in the ‘newspaper’ business American Drew Noyes, 56, publisher of the Pattaya Times, and now facing charges of extortion, Mr. Colov claims integrity and hob nobs with the Mayor and civic leaders. But, as the ‘Flying Sporran’ has already demonstrated since his arrival in Thailand, he has been associated with dodgy deals. Take this picture for instance taken on another of Colov’s trips home. This photo was taken before Lonne had his tattoos done. He is a bit plumper and enjoying a beer on one of his freedom days. That’s Lonne on the left of course, and next to him is a man called Leon Owild. Mr. Colov of course is on the right. So who is Leon Owild? Well he has written a book called ‘Smuggler King, Gangster, Millionaire’. You get the picture. Under British law crooks cannot profit, by writing books for instance, out of the proceeds of crime, so, I trust if Danish law is the same, he gave his profits to charity. “Read about Owilds very colorful life back from his rough childhood and youth, his many years of life’s darker side, including his exciting life as a smuggler king, when he with his smuggler friends in the 1960s and ’70s provided” little man “and. other good people in Denmark with the coveted cheap cigarettes. “Read about the many criminal” boys “, who together with Owild lived the gay life in the Copenhagen underworld.”. Sounds like a saint looking after the ‘little’ man in Denmark. Cigarettes? Yes he did those too. But that’s Owilds view. Danish Police say he has skipped a few chapters. But back to Lonne, now 62. When he was arrested in Thailand in 2005 he was accused of hiring two brothers to burn down a house in Kokkedal, some 30 minutes outside Copenhagen. The house was apparently destroying a friend’s view. Some 64% of the residents of Kokkedal are immigrants, or sons and daughters of immigrants. The two brothers, 29 and 34, were also in the drugs trade and at the time accused of smuggling 13 tons of hashish into Denmark in cooperation with the supposed 37-year Danish kingpin in Brazil, Claus Malmquist, (right) – convicted in Copenhagen. in 2009 and jailed for 16 years in Rio de Janeiro Arrested After being for his part in The smuggling of The. 13 tons of Marijuana , and also attempting to smuggle 500 kilos of Cocaine. The Danish newspaper Ekstra Bladet reported:. “Lonne ‘has been in jail for half of his life. He has for the last 30 years been a known and notorious face in the ‘red light’ area Vesterbro, Copenhagen “. Vesterbrogade by the way is Colov’s stomping ground. Now its recovered to become quite a trendy area of ​​Copenhagen. “He (Lonne) has been convicted numerous times for drugs, robbery, receiving stolen goods, violence, alcohol and cigarette smuggling, pimping and extortion. He went in first time in 1963 in juvenile prison. “In 1992 he received six years in prison as one of the kingpins of a Danish group from Pattaya in Thailand which smuggled huge quantities of heroin to Denmark. 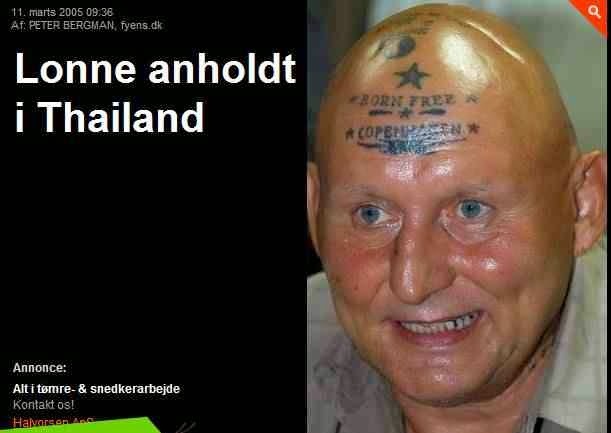 In Pattaya he was in the inner circle of Danes in the seaside town that sent smugglers to Denmark. with heroin. Two of the Dane-gang’s couriers were arrested in Thailand and received life imprisonment. “. Lonne does not appear be the sort of person, a Knight of Rizal, Rotary Club President, let alone Police Chief, should be associating with. But wait. There’s more. Forget about his offences of pimping, violence in Vesterbrogade, drugs smuggling, and drugs dealing, Lonne was also accused of beating up his wife. The attack was not pretty. “After the attack the 41-year-old woman was so damaged that she had to be treated in the emergency room. Her nose was broken, and according to doctors she had risk of permanent eye damage. “Prosecutors said, however, that there were repeated fist blows.”. The damage was extra severe because “Lonne” wore two large ornamental rings on his little and ring fingers. “. Apparently Lonne claimed his wife had slept with another man. This is a picture of Niels Colov, centre, drink in hand in his gangster days. This is just before the time he was arrested for pimping, handling stolen goods and violence and was jailed for 15 months. And this is a picture of the new look Niels Colov, quiet assuming, teetotaller, Buddhist, vegetarian, hugging the Mayor and being hugged by the Deputy Mayor of Pattaya. Which image is true? Has Niels Colov really made a major recovery from his criminal past. Or has he simply just re-invented himself? Mr. Colov is currently in Denmark visiting his father.